Despite its name, the Republic of Iceland is far from icy for much of the year and although the summer months could hardly be described as hot, they are mild, pleasant and often sunny, being warmed by the adjacent North Atlantic Current. However, for seven months of the year, snow flurries are commonplace in Iceland, meaning that the country has plenty to offer in the way of winter sports, such as the ever-popular snowmobiling. Located on the far north-western side of Europe, Iceland is filled with natural interest and attractions, including endless steaming springs and geysers, enormous glaciers and even a number of active volcanoes. Iceland is famed for its Viking past and Norse customs and has developed a strong identity with many traditional foods, such as 'porramatur', which is often made with lamb, Greenland shark, dried fish or even seal's flippers. The main tourist season falls between May and August, when visitors flock to the country to enjoy its beautiful scenery and diverse wildlife, which features everything from puffins to whales. Outside of this time the Icelandic tourism industry slows down, although Reykjavik, the capital city, still remains a popular destination. Reykjavik is actually the most northerly capital city in the world and lies on the south-western side of Iceland, next to the Faxaflói Bay. During the heart of the winter, Reykjavik only receives four or five hours of daylight, meaning that the views of the Northern Lights are spectacular. Conversely, in the summer, the nighttimes resemble the daytimes, remaining bright all through the night. 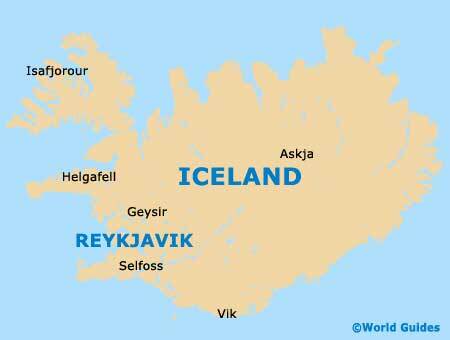 The world's northernmost capital city, Reykjavik has long been Iceland's most popular city. Visitors are often surprised to find the weather in Reykjavik milder than expected, with the summer sun setting well after midnight.